A Super Bowl Ad for your Super Bowl Party. Forget the game—Super Bowl ads are a global phenomenon. Each year, brands go big advertising their products. In 2018 Tostitos did the opposite. As the official chip and dip of the NFL, Tostitos wanted to get people together to watch the game. So instead of creating an ad for itself, it created one for everybody throwing a Super Bowl party. 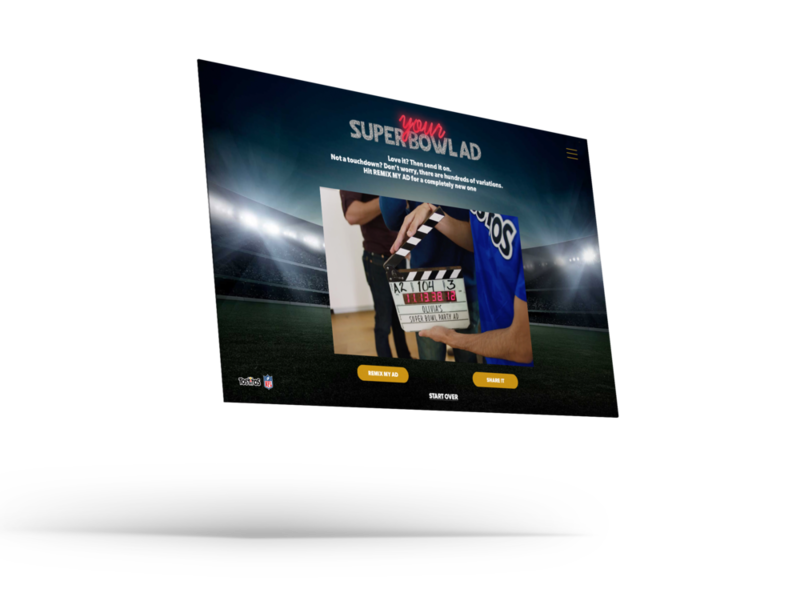 “Super Bowl Ads For All” is a Super Bowl ad generator that transformed people’s party details (host’s name, address, and party start time) into a fully personalized commercial. These films featured all the Super Bowl–ad clichés, resulting in over 300 different commercials for people to share with family and friends. What’s more, anyone who received one of these films was retargeted with online ads reminding them to show up. These ads also featured a coupon for people to use to bring Tostitos products to the party.